I learned how to tie a bowline knot today. Swain’s in Glendale, California, had a 3 for the price of one canvas sale. Rick is away helping his mom get her house set up for the winter, so I thought I would surprise him with 6 new 48×60 inch canvases to paint when he gets home. The canvases are too big to fit in my car, and even too big to fit inside the jeep. Luckily the hard top was on the jeep. 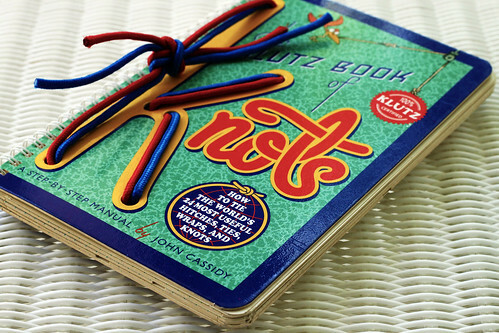 Luckily I never tossed out the knot tying book I bought Alex when he was a kid. Luckily the canvasses were not sold out. So now I have my surprise waiting for him. I was amazed how easily the knots were to tie and how securely they held for the hour freeway trip home. I used the same knot to tie the 3 boxes of two canvases together first like an old fashion tied parcel. I was then amazed at how easy the rope ties criss-crossing the boxes made getting the canvases on top of the jeep. I was so worried that something would go wrong. The bowline knot is amazing. This entry was posted on Sunday, September 13th, 2009 at 3:00 am and is filed under Life. Tagged: Book. You can feed this entry. You can leave a response, or trackback from your own site.